IMPORTANT INFORMATION FOR HOLIDAY SHOPPERS! UPDATE 12/13/18 – we’re now past the date where most items would arrive in time for 12/25 without rush shipping. We may still be able to accommodate rushes, but please CONTACT US by phone or email to inquire about possibilities and potential cost, should you need something in a hurry. Many of our items are made-to-order or hand-finished in our studio in small batches. When you order, please see the below schedule showing the latest dates to order for potential US delivery before 12/25/18 and learn which items may not or will not arrive before that date. Please do not hesitate to reach out to us with any questions regarding a potential purchase! We’re here to help! 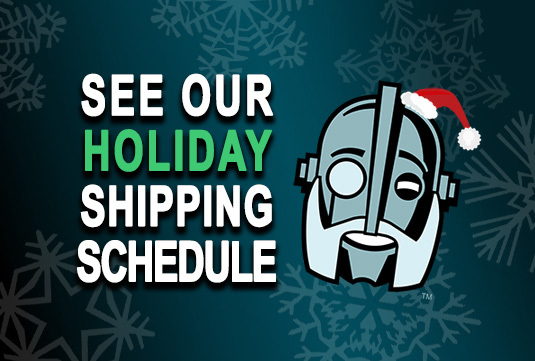 ORDER BY 12/12/18 – The following items will ship ASAP via USPS Priority Mail or Fedex Ground service and should arrive before 12/25/2018 when ordered before midnight PT, December 12th, 2018. After that point, please contact us to inquire about rush shipping options and costs. Star Wars Directors Chairs and Replacement Canvas Sets. We have an extremely limited stock of the following Star Wars items. Orders will be filled on a first-come, first-served basis but we cannot guarantee delivery before 12/25/18. We’re sorry, but the following Star Wars items WILL NOT ARRIVE before 12/25/2018. Please feel free to place an order, but these items are made to order and take several weeks to create. They will ship based on the wait time shown on each item’s page. ORDER BY 12/12/18 – The following items will ship asap and should arrive before 12/25/2018 when ordered before midnight PT, December 12th, 2018. After that point, or if you’re outside of the US, please contact us to inquire to see if there are any rush shipping options and potential costs. We’re sorry, but the following items WILL NOT ARRIVE before 12/25/2018. Please feel free to place an order, but these items are made to order and take several weeks to create. They will ship based on the wait time shown on each item’s page. All Custom Studio Creations – Dino Decor, Stalagtable, etc. We want to take a moment to thank everyone who’s ordered with us this year… Thank you all for following along and keeping up with what we create! We sincerely we hope you have a wonderful holiday season! All the best to you and yours from the artists of Regal Robot!